Scheduling a color consultation with a Baltimore professional painter to determine the correct color for your interior painting is a wise choice if you haven’t brushed up on your color theory knowledge in a while. A professional painter can help you pick a suitable paint color for the interior of your home, and booking a color consultation will help to reduce the pressure and decision fatigue you may feel toward your home improvements. Recognizing how colors influence our attitudes is important. If a room in your home gives off “bad vibes” and you can’t figure out why, a color consultant or painter can help you eliminate it and choose the correct color using color psychology. The effects of lighting also contribute to interior color selection. The appearance of colors change when light sources change because of the combination of light frequencies that our eyes perceive. A painter can suggest certain colors that do not shift in different types of light. A color consultant can act as a mediator in the color selection process if more than one person is participating in the decision. The consultant can serve as the objective third party needed to accomplish an acceptable compromise according to color theory, lighting, furnishings, your preferences, and overall flow. A professional painter can help you acknowledge the constants within your interior space, including flooring, wood grain, brick, countertops, and cabinets. The “flow” of these constants and color from room to room should be considered before paint is chosen and applied. 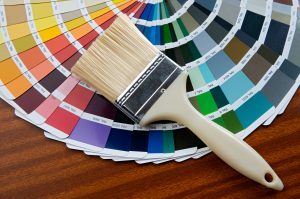 With a professional color consultation and a Baltimore painter’s expertise, you won’t be overwhelmed by the plethora of options available to you. If you want your color selection process to be quick and simple but still incorporate your tastes and preferences, contact Annapolis Painting Services. If you need to hire a professionally licensed house painter for interior painting services, call Annapolis Painting Services today at 410-974-6768, or fill out our online request form.